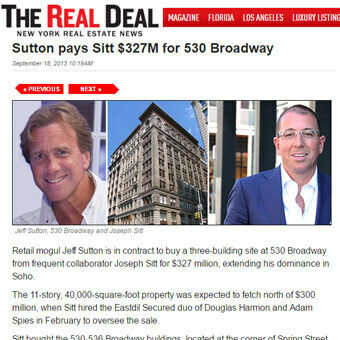 Retail mogul Jeff Sutton is in contract to buy a three-building site at 530 Broadway from frequent collaborator Joseph Sitt for $327 million, extending his dominance in Soho. The 11-story, 40,000-square-foot property was expected to fetch north of $300 million, when Sitt hired the Eastdil Secured duo of Douglas Harmon and Adam Spies in February to oversee the sale. Sitt bought the 530-536 Broadway buildings, located at the corner of Spring Street, for $190 million in 2007, sources told the New York Post. He later bought back the debt at a discount, saving roughly $40 million, the sources added.